There are 16 internet computers available for use. You will need a library card to use the internet computers. You can either sign in at the computer station or if all computers are taken, at the reservation computer by the copy machine. There is a 1 hour time limit per session and a maximum time limit of 2 hours daily. You must be at least 8 years old and a patron in good standing to use the internet computer. If you cannot apply for a library card, we can give you a guest pass for the day. We will need to see some form of identification in order for a guest pass to be issued. $0.20 will be charged for black and white and $1.00 for color prints / copies in standard size (8.5"x11"). Legal size (8.5"x14") are $0.30 and $1.50 respectively. For those bringing their own device, we have several seating areas you can plug your device into for power. There is also free wireless connectivity available throughout the building. A fax machine is also available. The cost is $2.00 for the first page and $1.00 for each additional page for outgoing faxes and $.50 for each incoming page. Ask for assistance at the circulation desk. There is a Keurig coffee machine by the entrance to the left. We sell Keurig containers for $1.00 each at the circulation desk. Flavors vary but regular coffee, decaffeinated coffee and hot chocolate are staples. All beverages must be consumed in this area. A program room is available for the public to use. Reservations in advance are required. Please see the Program Room section for more information on fees, deposits and application. 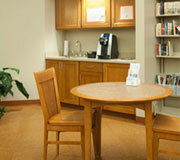 There are 3 private study rooms available for quiet study and discussion. Patrons must be of high school age or older to reserve the room. There is a limit of a 2 hour block per day. Use of the room is on a first come, first serve basis. You must sign in and out at the circulation desk. No food is allowed in these rooms. There is a limit of 4 occupants at one time. Technology has expanded the service of libraries. In addition to borrowing materials from our collection, you may also borrow eBooks to your personal computer or tablet. If we do not have an item in our collection, you can also request the item through interlibrary loan. We will borrow that item from another library on your behalf. You must be a Paw Paw School District resident to use these services.